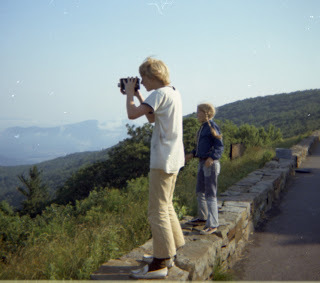 When I was in 8th Grade, the family took a Summer trip, leaving the flat Midwest for D.C., Williamsburg, Monticello, and Shenandoah National Park. I negotiated the last part of the itinerary, and when we camped at Big Meadows, I was excited that the legendary Appalachian Trail weaved around the campground. I "hiked" it about a quarter mile from our campsite to a place on the map called David Spring and wondered how many thru hikers had used the spring through the years to re-hydrate. (Probably none - they used faucets at Big Meadows.) 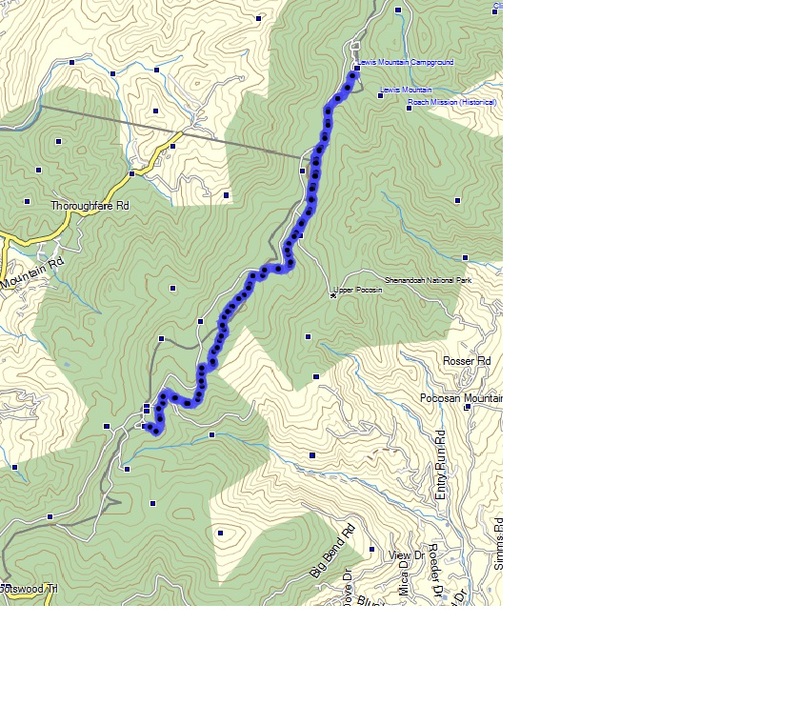 And I hiked the AT south from Big Meadows not much more than a mile to see Lewis Falls with my father. It was exciting to think that I was hiking a tiny portion of this historic trail. Even though hiking a microscopic section, I was linked with hikers from Georgia to Maine. While visiting SNP, I bought my first PATC map of Shenandoah's Central District and returned home to spend hours dreaming of the trails I would someday explore. 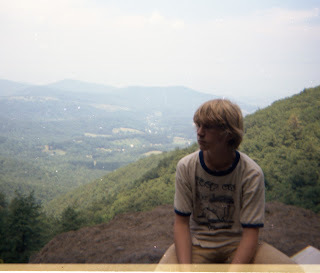 Twenty years later, I moved to Virginia and started again my hikes in the Virginia mountains. It is now twenty years after that. I have hiked many trails in the Blue Ridge and Alleghenies. The one trail I have generally avoided? The Appalachian Trail through Shenandoah National Park. The reason? It is boring. There is really only one reason to hike the A.T. through Shenandoah if you are not a thru hiker: to say you have hiked it. It does not pass any waterfalls, it stays too close to the Skyline Drive, there are few difficult climbs, and it misses many of the best parts of SNP. I hiked it through the Southern District of SNP years ago, but gave up as it entered the Central District, as there were too many other interesting trails to hike. Apparently, I am not the first to realize the downside of routing the A.T. near the Skyline Drive. I've been reading some historical stuff from the Potomac Appalachian Trail Club indicating that Benton MacKaye, the original visionary behind the A.T., and Myron Avery, a close confidante and man behind the PATC, split over their disagreement about whether the Skyline Drive should go through Shenandoah National Park. The A.T. preceded the Drive, and no doubt the latter's construction changed the A.T. experience dramatically through this part of Virginia. On April 13th, I checked off a section of the A.T. that had I hadn't yet hiked. When I completed several sections further south in Shenandoah National Park, I would stash a bike at one end, hike to it, and pedal back to my car. I thought about doing this again, but the dog wished otherwise, so I hiked the A.T. between the South River Picnic Area and the Lewis Mountain Campground both northbound and southbound. Best overlook on this section of trail. This section started about 5 miles north of the U.S. 33 entrance at the South River Falls trailhead, and headed north to the Lewis Mountain Campground. I stayed at this campground one weekend a couple of years ago with my own son. It has an interesting history. According to the Ken Burns series on the National Parks, Lewis Mountain was original conceived as a "separate but equal" camping facility for African Americans, and operated that way from 1932 through 1940, five years into the operation of the park. Lewis Mountain wasn’t fully integrated until 1947, when the park reopened after World War II. Lewis Mountain is the smallest campground in Shenandoah. I thought it was a great place, and loved that it was tent only. 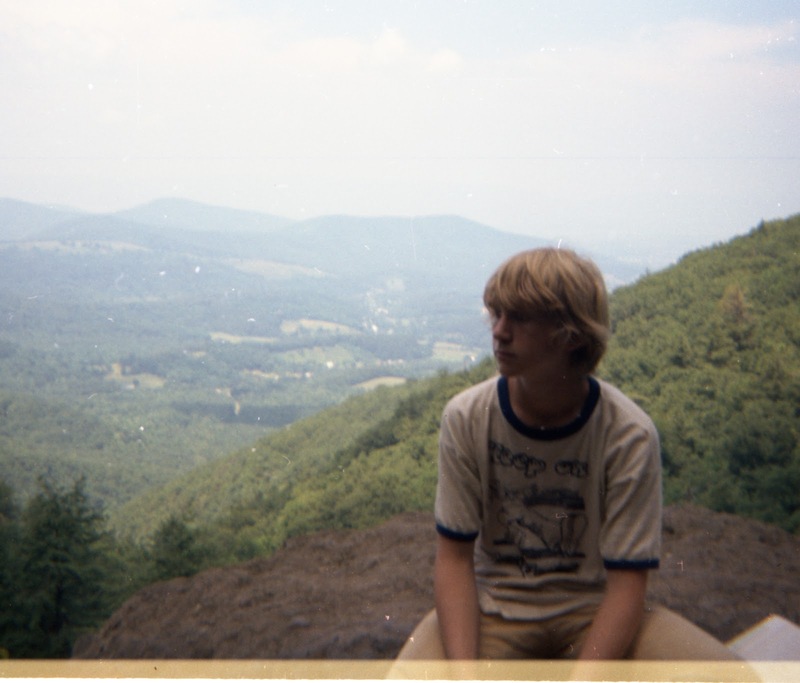 While there, my son and I hiked Bearfence Rocks to the north, and traveled there and back using the A.T. This section of the A.T. south of Lewis Mountain reaffirmed my opinion about the dullness of the A.T. through Shenandoah National Park Traversing over 5+ miles of trail, I came upon two B- level overlooks on the trail. My heart never raced from the workout. No waterfalls. Nothing memorable. Parts of it were within 20 yards of the Skyline Drive, with cars whizzing by. So what is the point of hiking this trail? And yet I saw a surprising number of hikers and backpackers on this section of the trail, including a family doing a test hike for a group of Northern Virginia Boy Scouts later in the month. I can only guess that these folks share the same awe of the A.T. that I had when I was a kid from the Midwest. Maybe I need to get some of that back. I used to think that these concrete posts were along all the A.T. It was only after moving East that I learned these are specific to Shenandoah National Park. We've been working on covering the AT through Shenandoah. Why? Partly because it's there, but we also really enjoy it. I find the rolling terrain to be peaceful and relaxing. There are fantastic views near Loft Mountain and also along the stretch between Skyland and Mary's Rock. We've seen lots of bears and other wildlife along the trail. Sure... it's not the most challenging terrain and it doesn't offer the best views, but I still love it. I'd rather hike a quiet section of the AT than suffer the more popular/exciting trails in the park (Old Rag, Rose River, etc). Thanks for the response! I have been enjoying your progression through the park on your great blog site. I agree that the A.T. can have some pretty nice sections - I recommend Mary's Rock to folks even though it is kind of the Humpback Rocks of Northern Virginia. On the other hand, I've always thought that A.T. hikers lose something by staying on that trail. For example. the Jones River Falls/Doyles River Falls hike parallels the A.T. in the Southern Section. It is a lot more crowded, but it is also a lot more interesting. Dark Hollow Falls is the same thing.